In The Seven Crystal Balls (1948), Seven scientists mysteriously fall into a profound state of lethargy. As Calculus has disappeared,Tintin and Captain Haddock set off in search of the Professor. Created in 1929 by Georges Rémi - who was already signing his drawings under the pseudonym of Hergé - Tintin will be subjected to twenty three adventures whose success - among those between 7 and 77 - has yet to wither. Mrs. Clarkson is married to one of the members of the expedition in which Professor Tarragon took part. Her brief - too brief - appearance in The Seven Crystal Balls remains unforgettable not only because she is a ravishingly preppy blond lady but also because women, pretty or not, occupy a very limited space in the world of Tintin. In 1944, as he had not yet created the heroes-on-paper which would make him famous, Edgar Pierre Jacobs became Hergé's assistant. They worked together on The Seven Crystal Balls which certainly explains the presence of this spirit of mystery and fantastic so dear to the creator of Blake and Mortimer and who is depicted by Hergé, harboring his legendary bow-tie, standing in a balcony on the left of the Hippodrome theater. The house of Professor Tarragon exists! Just like the six other scientists with whom he discovered the Inca tombs in Peru, Professor Tarragon falls into a lethargic sleep. The house which served as the model for his peaceful bourgeois residence can still be seen in Brussels, close to where Hergé used to live in the 1940's. Who is afraid of Rascar Capac? The mummy of Rascar Capac that Professor Tarragon and his colleagues brought back from Peru, is proudly displayed in the living room of his house. Created by Hergé for the purpose of this story, the mummy named after "he-who-unleashes-the-fire-of-heaven" was inspired from a piece Hergé found as it was part of a private collection in Brussels. 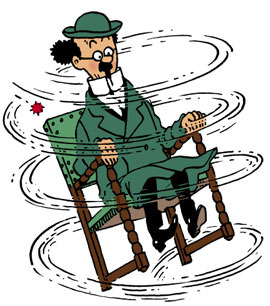 This is to Saint-Nazaire that the trail of Professor Calculus' kidnappers first takes Tintin and Captain Haddock. A local association called - for good reasons - "Les 7 soleils" (The 7 Suns), took the initiative to recreate the journey of both our heroes in the renown harbor city by displaying in an exhibition, giant reproductions of some "Nazairian" vignettes of the album.